A striker ball not in the game is considered dead on all balls in the game. A striker ball in the game is considered dead on all balls not in the game. However, a striker ball that is in the game cannot be blocked (rule 9.2) or wired (rule 9.3) by a ball that is not in the game. A striker ball not in the game shall have only one shot per turn, unless it scores the #1 wicket and earns a continuation shot under rule 6.1a. A striker ball not in the game may hit any other ball that is not in the game, but no roquet is made. If the other ball is peeled through the #1 wicket that ball is then in the game but is not entitled to a continuation shot. The striker of a ball not in the game may have any ball in the game lifted before the shot is played. Any ball lifted is replaced at the end of that shot. If the marked space has become occupied by another ball(s), the interfering ball(s) is lifted, the original lifted ball is replaced and the ball(s) that had occupied the space shall be placed on the ground up to nine inches in any direction the striker chooses from the replaced ball, but not in contact with any ball. 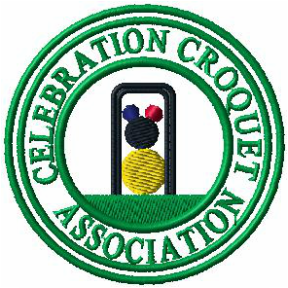 If a roqueted ball occupies the marked space, the original lifted ball is not replaced until after the croquet shot. If the striker ball occupies the marked space and the striker has a continuation shot remaining, the lifted ball is not replaced until after that shot. A striker ball that scores a wicket and in the same shot hits a ball that has not made the #1 wicket, is entitled to a continuation shot, unless the turn ends because of a fault or any ball goes out of bounds. The other ball remains where it lies, or may be lifted as in rule 5.4. A ball goes out of bounds as soon as its center lies directly over a boundary. When a ball goes out it is placed nine inches in from where it crossed the boundary. A ball less than nine inches from the boundary is also moved in, unless it is the striker ball and is entitled to play an extra stroke. The striker ball cannot both score a wicket and make a roquet on the same stroke. Whichever happens first takes precedence.